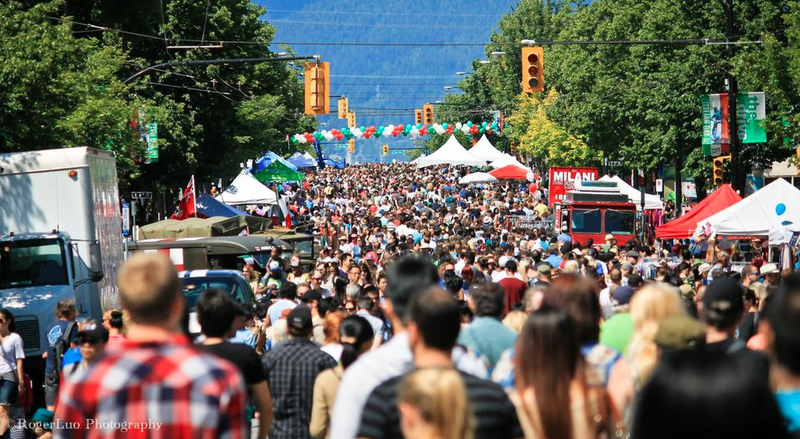 In one of the biggest displays of all things Italian outside Italy, Commercial Drive will be transformed on Sunday, June 8 for the 5th Annual Italian Day Vancouver. As one of Vancouver’s most celebrated cultural festivals, Italian Day is a showcase of classic style, masterful design and superior quality that represents ‘Made in Italy.’ From inventions to Italian goods to lifestyle products, this year’s Italian Day celebrates everything that makes Italy unique – many of which are found in our very own backyard. Last year, 300,000 attendees took over The Drive with a passion to embrace Italian culture and celebrate the contributions made to this city by Italian immigrants and subsequent generations of Italian-Canadians. Similar numbers are expected for this year’s festivities with activities that are fun for the whole family. Recognized as Vancouver’s very own ‘Little Italy’, The Drive will be transformed into a vibrant street festival, with the goal of sharing the quality and wealth of Italian culture with Vancouver’s multi-cultural community. From food to performing arts, fashion, merchants and activities, Italy’s unmatched sense of style will be the centerpiece at this year’s event, which gets bigger and better each year. La Festa della Repubblica Tent – Stop by the tent after 2:00 pm (located at 2nd and Commercial) to celebrate Italy’s National Day and discover more about Italy’s culture and lifestyle. You will also learn about the upcoming Expo Milano 2015, which has the theme of Feeding the Planet, Energy for Life. The Expo Milano 2015 will take a deeper look at problems of nutrition and the resources of our planet, which are major challenges that are relevant to everyone today. Fashion Show by Romielle Designs with Kalena Shoes – Local mother/daughter designer team (Anastacia and Irina Shorohov) will show off their 50s-inspired Euro/Sophia Loren women’s couture collection with Kalena Shoes – a long-standing family-run Commercial Drive business – which will provide shoes to complete the ultra-feminine looks. Established in 1967, Kalena’s was named after the owner’s hometown in the Molise region of Italy and is proud to offer the largest selection of Italian shoes and accessories in Vancouver. Langley Ukulele Ensemble – This Ukulele youth group is sure to draw a crowd! As always, there will be food options galore to satisfy all of your Italian food cravings, including gelato, cannoli and pizza. Make sure you check out Bella Gelateria, Italia Bakery, Via Tevere, Dolce Amore and more. With its Tuscan-inspired patio setup and authentic Italian cuisine, Federico’s Supper Club is just one of the many Commercial Drive restaurants that will be extending its business with an outdoor patio so you can take in some sun and rest your feet. Italian associations, guest vendors and food trucks will line the street with authentic style food and merchandise. This year, partial proceeds of funds raised from Italian Day’s raffle will support Templeton High School’s SummerVision Arts Program for at-risk youth. The mastermind behind the program is Jimmy Crescenzo – a local actor and drama teacher at Templeton High School who is highly involved in keeping at-risk youth off of Vancouver streets. Raffle tickets are currently on sale now at select Vancity locations and will also be sold throughout the day with four generously donated prizes – the grand prize is a trip for two to anywhere in Italy (valued at $3,200), courtesy of long-standing Commercial Drive merchant Columbus World Travel.